A recent study by Energias Market Research has forecasted the global Printed Circuit Board (PCB) market to be worth $80.38 billion by 2024, growing from $60.42 billion in 2017 (CAGR of 4.2%). According to the report, factors driving the growth of the market are: rising adoption of automation in various end-user industries, growing demand for wireless devices, increasing miniaturization of devices, surging need for more efficient interconnect solutions, and rapid growth in flexible circuits. Owing to the implementation of processors and sensors in smart gadgets, the size of the PCB has reduced to 74%. Additionally, usage of flame retardant chemicals in PCBs to ensure fire safety, and increasing capital investment is further augmenting the market growth. Moreover, huge growth in global PCB market is also led by the increasing demand for smart tablets and smart phones in IT and consumer electronics sector. Growth in wearable electronics is emerging as a key opportunity in the growth of the global PCB market. Printed Circuit Board is a circuit board in which a thin layer of copper is laminated, that offers an interconnection to the electronic components. To place electronic components on the insulated board, holes are created with the help of drillers. Further, components are mounted on the PCBs and soldering is done to fix the electronic components in a specified area. It provides a support to the electronic components and the electrical connection carrier. PCBs are used to electrically connect the components and provide a base. With the rapid development in technology, electronics products will continue to emerge. But, massive production of PCB is becoming unfriendly to environment, due to the usage of wet chemicals while manufacturing. Moreover, lack of recycling ability also degrades the adoption rate of printed circuit boards. And to ensure less toxic emissions into the environment, ink jet printing technology is invented. This technology enables the cost-effective manufacturing of thin, flexible and disposable electrical devices. Recently, Taiwan-based manufacturer, Wistron, had announced plans to relocate its PCB manufacturing plant in Bengaluru, India and invested about $1 billion in the new ink jet printing technology for greener production capabilities. Geographically, the global printed circuit board market is segmented in Asia-Pacific, North America, Europe, and Rest of the World. Asia-Pacific is dominating the global PCB market in 2017 (77%), followed by North America. The growth in APAC region is attributed to the presence of many semi-conductor manufacturers, growing adoption of smart devices. North America is expected to hold the second largest market during the forecast period. Based on type, multi-layer PCB is expected to dominate the global PCB market in 2017, and also emerging as fastest growing segment during the forecast period. On the basis of substrate type, standard multilayer segment held the major market share. Rigid-flex printed circuit board is likely to register the highest CAGR during 2017-2024. The growth is owing to the increasing demand for display applications and rising adoption of smart phones. Based on PCB laminate Type, FR-4 PCB laminate type dominated the global PCB market share in terms of value. This material provides a cost effective and reliable solution for the various designs. On the basis of end-use, communication segment held the major market share in 2017, and is likely to register the fastest CAGR during the forecast period. The growth in the segment is owing to the increasing adoption of digital devices such as mobiles, networking equipment, power distribution system, amplifiers routers, etc. Automotive is experiencing a fastest growing segment. Key players are AT&S; Nippon Mektron, Ltd; Unimicron Corp; Samsung Electro-mechanics; Dynamic Electronics Co Ltd; Daeduck Electronics Co Ltd; CMK Corporation; Nan Ya PCB Co Ltd; TTM Technologies; Shenzhen Kinwong Electronic Co Ltd; among others. 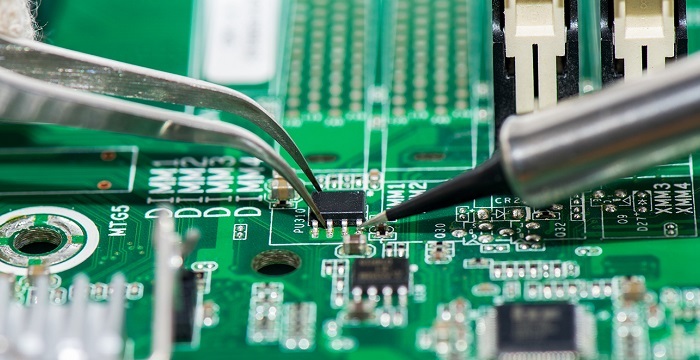 The report, Global Printed Circuit Board (PCB) Market Outlook, Trend and Opportunity Analysis, Competitive Insights, Actionable Segmentation & Forecast 2024, segments the global printed circuit board market on the basis of type, substrate type, components, PCB laminate type, laminate material type, end-use, and region.